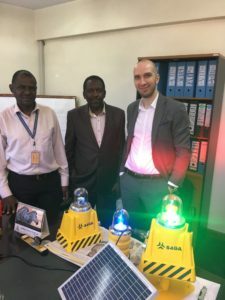 In February 2018, S4GA made a visit to Kenya Airports Authority (KAA) with the purpose of presentation of solar airfield lighting solutions. The meeting was held in KAA Head Office in Nairobi on behalf of S4GA’s local official partner. S4GA specialist presented Company’s achievements, projects and product range to KAA Management Board. Afterward, product training was conducted for engineers from KAA technical department. As a result of the meeting, the parties agreed that solar airfield lighting is a reliable and cost-effective solution for airports in Kenya. Extremely low maintenance cost, easy installation and zero expenditures on electricity makes solar AGL a priority product to invest in Kenyan airports industry.